3 cups Daiya shredded Pepper Jack and 1 cup Daiya shredded Mozzarella to finish. Toppings:Chopped Cilantro, non dairy Sour Cream and sliced pickled Jalapenos for topping. 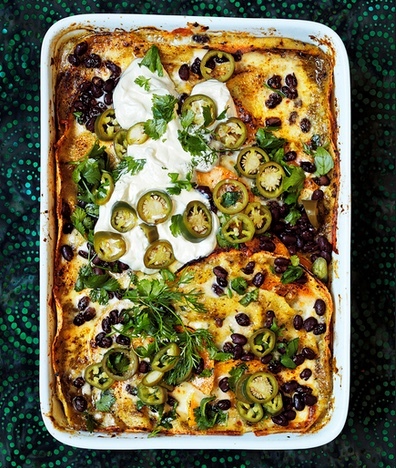 Spread 1 cup of the salsa verde in a 9 by 13″ baking dish and top with tortillas.Top with 1 more cup of the salsa, 1/3 of the butternut squash, 1/3 of the beans and 1 cup of the cheese, spreading evenly. Bake for 1 hour until the squash is tender. Uncover and sprinkle with the reserved 1 cup of cheese. Broil close to the heat until the topping is bubbly. Remove and let stand for 10 mins and decorate with the toppings and serve.